We put our backpacks on the wet pavement and leant against the wall of the closed train station. Waiting for somebody to come by searching for us, I translated the train station announcements from Russian to my German friends. “Why didn’t we get on a fast train if there are such trains in Russia?” Inquired one of my friends. 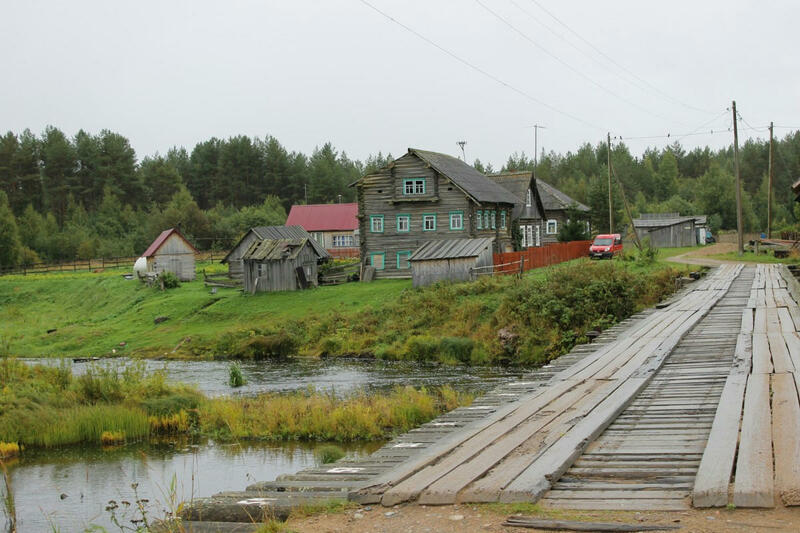 We booked the paddling trip through the north-west of Russia with an agency for “advanced travellers”. Indeed, it was not an ordinary trip. 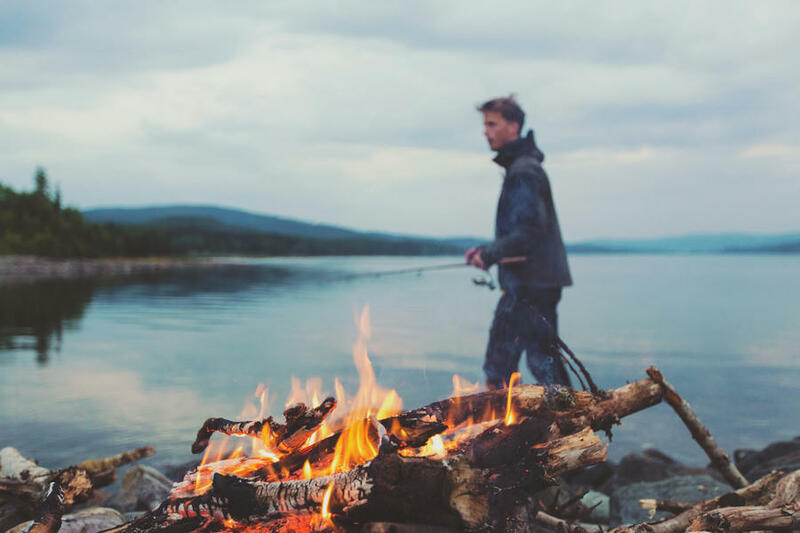 Even though there were no specific places of interest we were about to visit – just an uninhabited region of woods, lakes and rivers – the Russians we met while kayaking in the wilderness of the Russian North left a lasting impression on me and stayed vividly in my memory. Soon we had a chance to make acquaintance with the people we spent 5 unforgettable days with. Partly they were picked up from the train from Moscow – like we were, – another part of the group drove to the first base camp. During the welcome brunch at the base camp, two massive looking guys took places in front of me at the table. They were cardiologists from a small town in the European part of Russia and, as it turned out during the trip, hard drinkers and chain smokers. I think I saw them either with a cigarette between their teeth or lighting a new one from a roach. Their friend, clad in a military-style overall, turned out to be the most intriguing protagonist of the whole party as the story will show soon. Then, there was a pair of hipster girls in their 20ies from Moscow and two instructors. Soon, our things were repacked into waterproof bags, we got vests and helmets and were seated in the 2-person kayaks by the instructors according to their ideas of archiving maximum proficiency. That meant the girls who were claimed to have no talent in rowing were seated in the front of the boats. The massive-looking cardiologists got a two-person kayak each. Maybe because they had to put in twice the effort or because smoking had not had the best consequences on their cardiovascular health, they formed the tail of our group from now on till the last day. But it was just a 2-hour paddling over a lake to a nearby island on our first day. The island was a paradisic one. 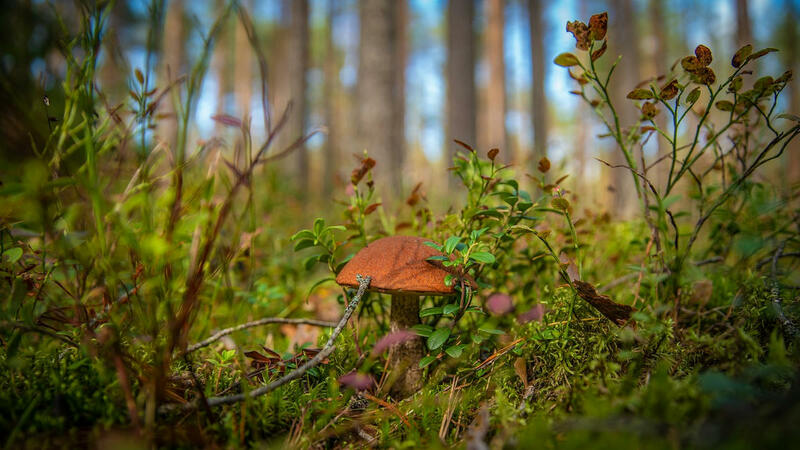 Just instead of coconuts, there were giant mushrooms and blueberries everywhere. For the rest of the week, we had mushrooms in all of the dishes we had for dinner and blueberries were the main ingredient of all the deserts. The most popular was a very sweet condensed milk “sgushenka” poured onto a cup full of fresh big blueberries. At dinner time we all got together again. Or, better put, we formed two groups. The first one consisted of the last-to-arrive cardiologists reunited with their military clad friend and the instructors. Hunting, fishing and cars were the topics to discuss and the military-clad friend had the most fascinating stories to tell. He had been flying over the Himalayas in a Deltaplane when his plane crashed, he broke his leg and spent days crawling around the mountains until he was found. He’d been taking part in the off-road trail competitions in the jungle of Nicaragua, he’d been one of the leaders of the trail, he said. But then he’d seen a car in a swamp and decided to give his competitors a hand so that they didn’t have to spend days waiting for help. I was curious if that is what he was doing for life, being an off-road pilot or so. “Not only you may not finance yourself, doing that kind of stuff, but these hobbies are also very expensive.” He instructed me. The military guy ignored my question and one of the cardiologists informed me in short that he had a business without specifying what kind of a business he had. “A Russian mafia guy” My German friends and I decided for ourselves. The cardiologists pulled out the cognac bottles and treated everybody. The mafia lad unpacked his self-made strong alcohol with herbs from his estate. “He has an estate!” I listed another proof of his mafia job to my friends. On the second day, we left the lake for the river. From then on, rowing definitely required less effort. The whitewater parts of the river were few and easy for the beginners as the biggest part of our group was. Myself, I had nothing to worry about at all: I was in the first kayak with one of the instructors. Having passed all the difficult parts of the river with flying colours, we usually went ashore. An instructor kept an eye on the rest of the group giving some tips while I was eating blueberries and raspberries that grew in abundance anywhere you stepped. A couple of times, we passed tiny villages or met other kayakers, but usually, it was just us. But even then, I dreamed of taking part in the ultimate wilderness kayak tour in the northern parts of Karelia one day. Some 500 km further north, one may spend 2 weeks paddling without seeing a single human soul – but bears! During the following evenings by the fire, we continued to learn new things about each other. I readily picked up all the puzzles I could to make a full picture of the mafia guy. He quit secondary school as a kid. He was planting a vineyard in his estate and building a stable. Once, I picked up parts of a conversation the mafia lad was taking part in. No need to say, I was really intrigued to find out what that book was – Dostoyevsky? Dan Brown? – and fortunately for me, that question was posed. 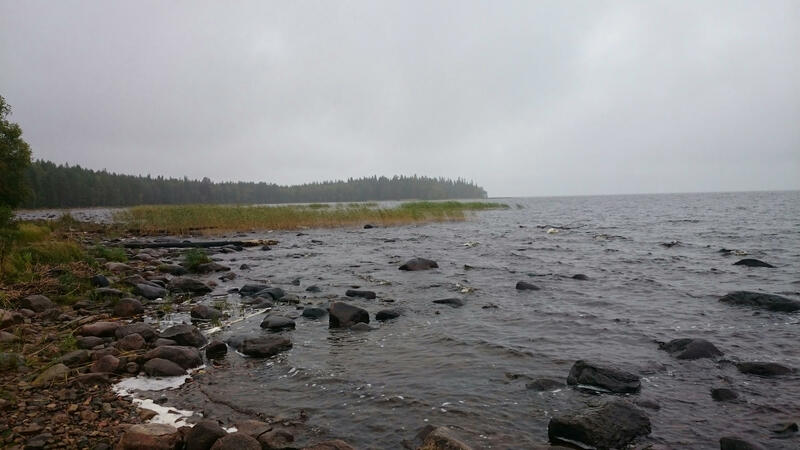 On the fourth day, we passed Vagatozero, another big Karelian lake before continuing on Shuya River. The waves could be several meters high here on a windy day, we were told, but we enjoyed a still weather ever since the beginning of the trip and the waves were quite moderate. Once, I found out the strength of the waves in the big lake as I was crossing a ford in another huge lake further north. It was on a 3-week long camping trip so I had a big backpack and my initial worry was that its weight would pull me to the lake’s bottom. However, it was almost the end of the 3 weeks long trip, so all the food boxes were empty and served as a bobber, pushing the backpack up out of the water. The strong wind pushed it the direction opposite from the shore and I made a huge effort in trying not to be blown away into the open water by the wind. On my last evening at the last base camp of this kayak Karelian trip, I still managed to get into some trouble. But it was trouble of a funny kind. There was a banya we could use by the roaring river some hundred meters behind the camp. Russian banya visits consist of two important parts: sweating in the plus 80° C heated small room and jumping naked into the cold water. Being a huge fan of swimming, I swam a bit from the river bank and was immediately taken by the current. 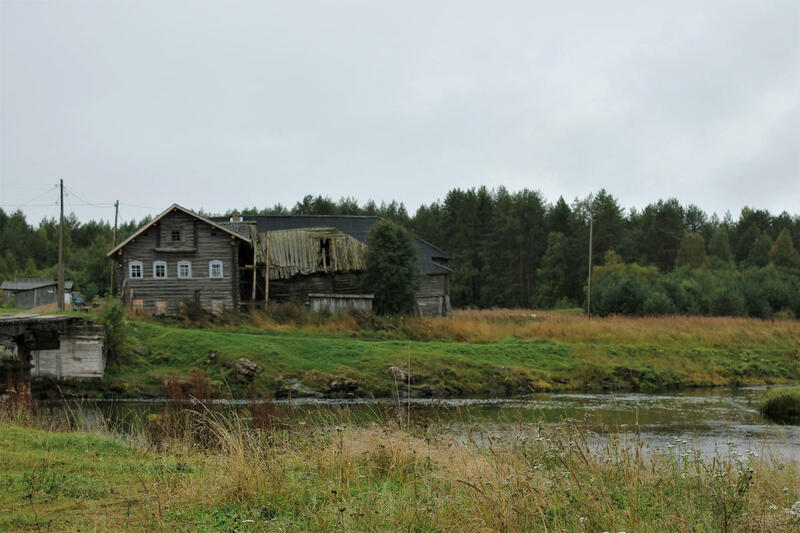 Until I got back to the river bank again, I was far away from the banya house. I had to walk back to it bare naked for some 5 minutes. But fortunately, the chance of being seen in the wilderness of Karelia by other humans is almost not existent.